Ignore the jingoism, from politicians and the press—the tenth anniversary marks a tenth year from hell. I was there. And “there” was nowhere. And nowhere was the place to be if you wanted to see the signs of end times for the American Empire up close. It was the place to be if you wanted to see the madness—and oh yes, it was madness—not filtered through a complacent and sleepy media that made Washington’s war policy seem, if not sensible, at least sane and serious enough. I stood at Ground Zero of what was intended to be the new centerpiece for a Pax Americana in the Greater Middle East. Not to put too fine a point on it, but the invasion of Iraq turned out to be a joke. Not for the Iraqis, of course, and not for American soldiers, and not the ha-ha sort of joke either. And here’s the saddest truth of all: on March 20 as we mark the tenth anniversary of the invasion from hell, we still don’t get it. In case you want to jump to the punch line, though, it’s this: by invading Iraq, the United States did more to destabilize the Middle East than we could possibly have imagined at the time. And we—and so many others—will pay the price for it for a long, long time. By then, the US “reconstruction” plan for that country was drowning in rivers of money foolishly spent. As the centerpiece for those American efforts—at least after Plan A, that our invading troops would be greeted with flowers and sweets as liberators, crashed and burned—we had managed to reconstruct nothing of significance. First conceived as a Marshall Plan for the New American Century, six long years later it had devolved into farce. In my act of the play, the United States spent some $2.2 million dollars to build a huge facility in the boondocks. Ignoring the stark reality that Iraqis had raised and sold chickens locally for some 2,000 years, the United States decided to finance the construction of a central processing facility, have the Iraqis running the plant purchase local chickens, pluck them and slice them up with complex machinery brought in from Chicago, package the breasts and wings in plastic wrap and then truck it all to local grocery stores. Perhaps it was the desert heat, but this made sense at the time, and the plan was supported by the Army, the State Department and the White House. Elegant in conception, at least to us, it failed to account for a few simple things, like a lack of regular electricity, or logistics systems to bring the chickens to and from the plant, or working capital, or… um… grocery stores. As a result, the gleaming $2.2 million plant processed no chickens. To use a few of the catchwords of that moment, it transformed nothing, empowered no one, stabilized and economically uplifted not a single Iraqi. It just sat there empty, dark and unused in the middle of the desert. Like the chickens, we were plucked. In keeping with the madness of the times, however, the simple fact that the plant failed to meet any of its real-world goals did not mean the project wasn’t a success. In fact, the factory was a hit with the US media. After all, for every propaganda-driven visit to the plant, my group stocked the place with hastily purchased chickens, geared up the machinery and put on a dog-and-pony, er, chicken-and-rooster, show. In the dark humor of that moment, we christened the place the Potemkin Chicken Factory. In between media and VIP visits, it sat in the dark, only to rise with the rooster’s cry each morning some camera crew came out for a visit. Our factory was thus considered a great success. Robert Ford, then at the Baghdad Embassy and now America’s rugged shadow ambassador to Syria, said his visit was the best day out he enjoyed in Iraq. General Ray Odierno, then commanding all US forces in Iraq, sent bloggers and camp followers to view the victory project. Some of the propaganda, which proclaimed that “teaching Iraqis methods to flourish on their own gives them the ability to provide their own stability without needing to rely on Americans,” is still online (including this charming image of American-Iraqi mentorship, a particular favorite of mine). Anniversaries are times for reflection, in part because it’s often only with hindsight that we recognize the most significant moments in our lives. On the other hand, on anniversaries it’s often hard to remember what it was really like back when it all began. Amid the chaos of the Middle East today, it’s easy, for instance, to forget what things looked like as 2003 began. Afghanistan, it appeared, had been invaded and occupied quickly and cleanly, in a way the Soviets (the British, the ancient Greeks…) could never have dreamed of. Iran was frightened, seeing the mighty American military on its eastern border and soon to be on the western one as well, and was ready to deal. Syria was controlled by the stable thuggery of Bashar al-Assad and relations were so good that the United States was rendering terror suspects to his secret prisons for torture. Indeed, its mighty plan was disintegrating even as it was being dreamed up. In their lust for everything on no terms but their own, the Bush team missed a diplomatic opportunity with Iran that might have rendered today’s saber rattling unnecessary, even as Afghanistan fell apart and Iraq imploded. As part of the breakdown, desperate men, blindsided by history, turned up the volume on desperate measures: torture, secret gulags, rendition, drone killings, extra-constitutional actions at home. The sleaziest of deals were cut to try to salvage something, including ignoring the A.Q. Khan network of Pakistani nuclear proliferation in return for a cheesy Condi Rice–Qaddafi photo-op rapprochement in Libya. 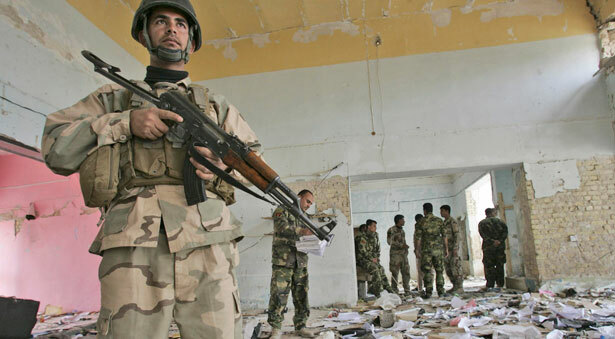 Inside Iraq, the forces of Sunni-Shia sectarian conflict had been unleashed by the US invasion. That, in turn, was creating the conditions for a proxy war between the United States and Iran, similar to the growing proxy war between Israel and Iran inside Lebanon (where another destabilizing event, the US-sanctioned Israeli invasion of 2006, followed in hand). None of this has ever ended. Today, in fact, that proxy war has simply found a fresh host, Syria, with multiple powers using “humanitarian aid” to push and shove their Sunni and Shia avatars around. Staggering neocon expectations, Iran emerged from the US decade in Iraq economically more powerful, with sanctions-busting trade between the two neighbors now valued at some $5 billion a year and still growing. In that decade, the United States also managed to remove one of Iran’s strategic counterbalances, Saddam Hussein, replacing him with a government run by Nouri al-Malaki, who had once found asylum in Tehran. Meanwhile, Turkey is now engaged in an open war with the Kurds of northern Iraq. Turkey is, of course, part of NATO, so imagine the US government sitting by silently while Germany bombed Poland. To complete the circle, Iraq’s prime minister recently warned that a victory for Syria’s rebels will spark sectarian wars in his own country and will create a new haven for Al Qaeda that would further destabilize the region. Meanwhile, militarily burnt out, economically reeling from the wars in Iraq and Afghanistan and lacking any moral standing in the Middle East post-Guantánamo and Abu Ghraib, the United States sat on its hands as the regional spark that came to be called the Arab Spring flickered out, to be replaced by yet more destabilization across the region. And even that hasn’t stopped Washington from pursuing the latest version of the (now-nameless) global war on terror into ever-newer regions in need of destabilization. The Iranian leadership watched carefully as the American imperial version of Iraq collapsed, concluded that Washington was a paper tiger, backed away from initial offers to talk over contested issues, and instead (at least for a while) doubled down on achieving nuclear breakout capacity, aided by the past work of that same A.Q. Khan network. North Korea, another A.Q. Khan beneficiary, followed the same pivot ever farther from Washington, while it became a genuine nuclear power. Its neighbor China pursued its own path of economic dominance, while helping to “pay” for the Iraq War by becoming the number-one holder of US debt among foreign governments. It now owns more than 21 percent of the US debt held overseas. Think of his comment as a warning. Having somehow turned much of Islam into a foe, Washington has essentially assured itself of never-ending crises that it stands no chance whatsoever of winning. In this sense, Iraq was not an aberration, but the historic zenith and nadir for a way of thinking that is only now slowing waning. For decades to come, the United States will have a big enough military to ensure that our decline is slow, bloody, ugly and reluctant, if inevitable. One day, however, even the drones will have to land. 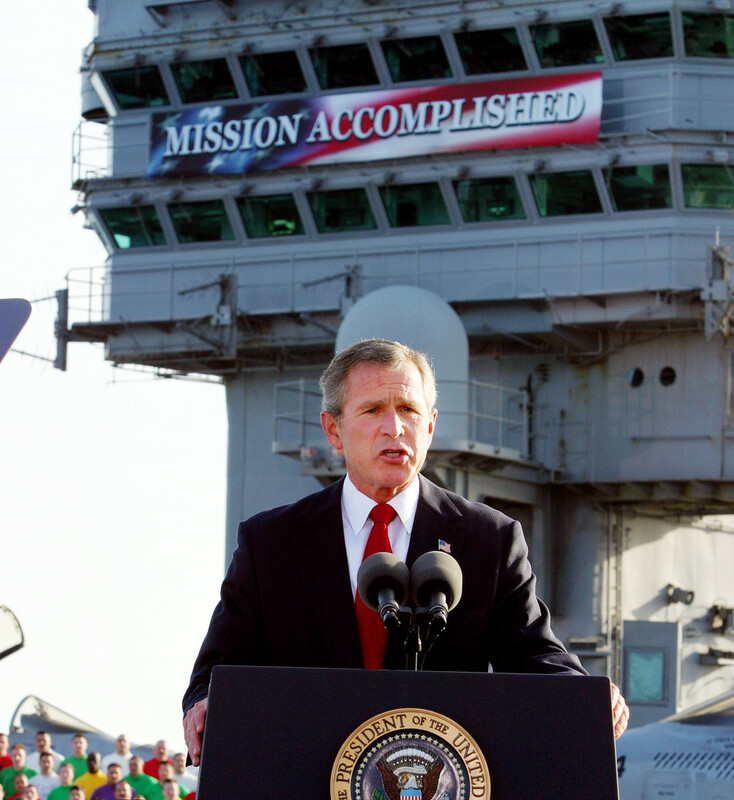 And so, happy tenth anniversary, Iraq War! A decade after the invasion, a chaotic and unstable Middle East is the unfinished legacy of our invasion. I guess the joke is on us after all, though no one is laughing. As Greg Mitchell argues, acclaimed journalist Bob Woodward’s biggest failure was getting snookered on Iraq.